I could eat seafood any time, what about you? 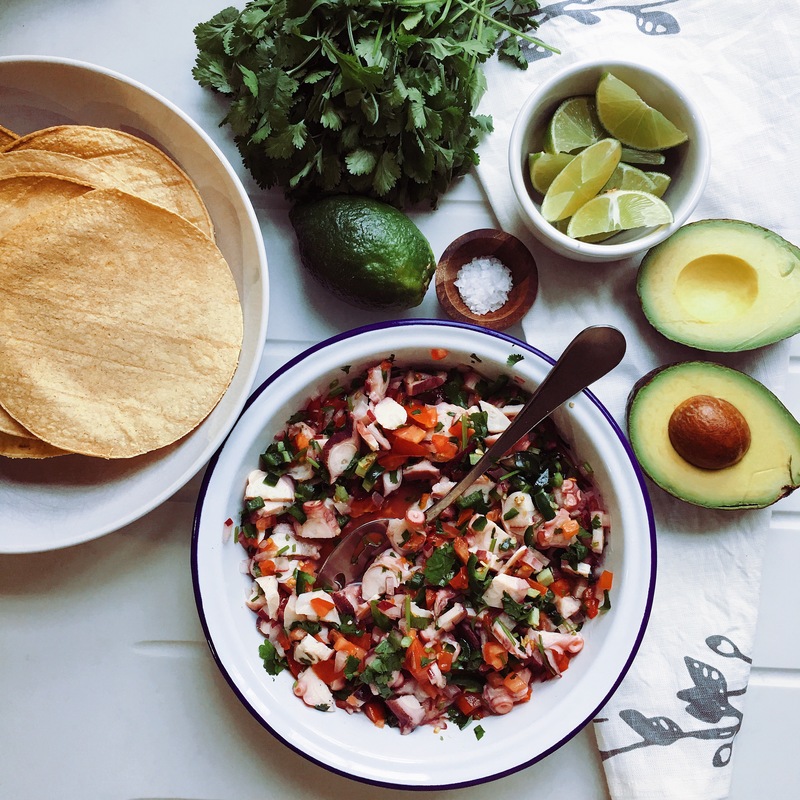 I just love the freshness of a good octopus, clams or oysters, I think they are just very attractive and luxurious, so any opportunity I get, I always cook something with seafood and today I managed to stop one of my cravings, Octopus Ceviche. For some reason I never managed to find fresh octopus in my neighbourhood, so whenever I can I take a trip to borough market and buy some in the fish mongers the market has or the other option is to buy octopus already cooked, which makes things easier and faster. Cook the octopus. Boil one pint of water or enough to cover the octopus. No need to add salt, add half a white onion and introduce the octopus, cook for around 30 min approx. Check every 15 min, prick the octopus and it feels firm, it is cooked. Let the octopus cool down and then cut it and put it in a salad bowl. Add the tomato, onion, coriander, dill, Worcester sauce, tomato juice, lime juice, salt and pepper and olive oil, mix very well and leave in the fridge for at least an hour before serving, so all the ingredients blend nicely. To make the tostadas, heat the oven on Gas mark 4, 180 C degrees. 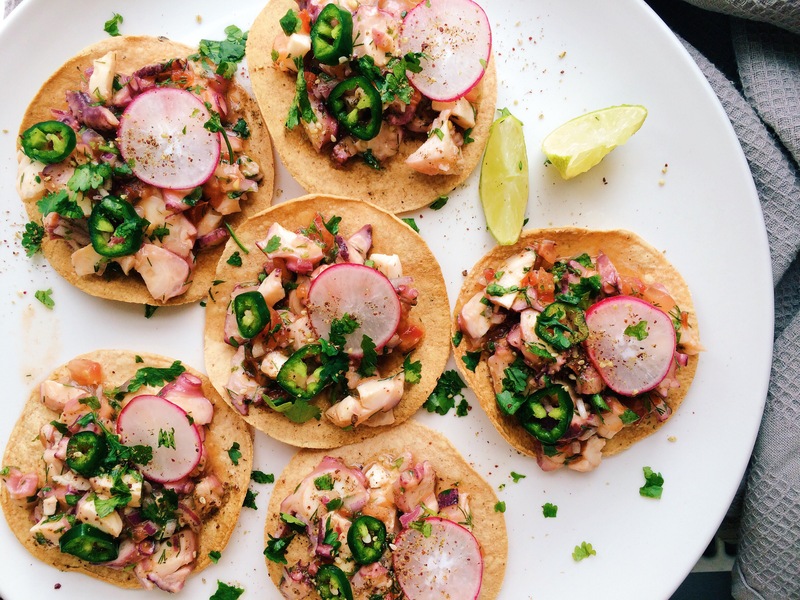 Place the corn tortillas on a tray and put them in the oven for around 10 min or until golden brown. To serve the tostadas. 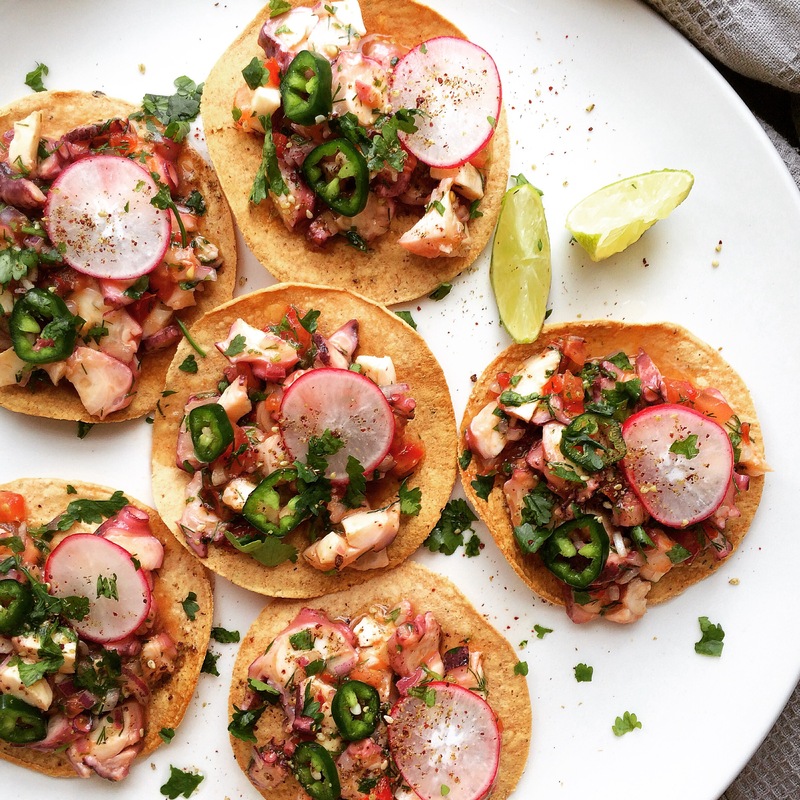 Place some octopus ceviche on top of a tostada, garnish with radishes, fresh chopped jalapeños, a bit of more lime and some of the nice Za’tar spice. Enjoy them with a nice cold lager! I bought my za’tar spice blend in Borough Market. Za’tar is a blend of sumac, herbs and salt. It goes very well with fish, vegetables and salads.